Dutch Post-Impressionist Painting: The Hague School, Amsterdam. The two main centres of Post-Impressionism in Holland in the second half of the nineteenth century were The Hague and Amsterdam. The Hague School was a loose association of Dutch painters who were active in the Hague during the period c.1860-1900. Specializing in naturalism - especially landscape painting and beachscapes - they also produced a variety of different types of genre painting, including church interiors. Some of their works had a romantic, nostalgic edge - not that dissimilar from the early 19th century Biedermeier style in Germany (1815-48) or that of Christen Kobke (1810-48) in Denmark. Their immediate counterparts in France, however, were the artists of the Barbizon School, and later the Impressionists. Like them, the members of the Hague School sought to capture the peculiar effects of light and atmosphere. Important members of the Hague group included: Bosboom, Johannes (1817-1891), the Maris brothers - Jacob (1837-1899), Matthijs (1839-1917), Willem (1844-1910) - Jozef Israels (1824-1911), Anton Mauve (1838-1888), Hendrik Willem Mesdag (1831-1915) and Johan Hendrik Weissenbruch (1824-1903), some of whom had an influence on Van Gogh and the Post-Impressionist Italian Divisionism of Giovanni Segantini. The Amsterdam group, who used a looser style of painting, focused on portraying the everyday life of the city, and became the leading centre for Dutch Post-Impressionist painting, from the late 1880s onwards. The group's most significant members - a few of whom were associated in their youth with The Hague - included George Breitner (1857-1923), Floris Hendrik Verster, Isaac Israels (1865-1934), Willem Bastiaan Tholen (1860-1931), Willem de Zwart (1862-1931), Willem Witsen (1860-1923) and Jan Toorop (1858-1928). Also included in the Amsterdam 'School' are a group of late-impressionist female artists known as the Amsterdamse Joffers (Amsterdam Young ladies), who were a group of young wealthy women artists who included Lizzy Ansingh (1875-1959), Coba Ritsema (1876-1961) and Suze Bisschop-Robertson. The Dutch painter Johan Barthold Jongkind (1819-91) is regarded as an important forerunner of Impressionism (he influenced Boudin, who influenced Monet), though he is associated with neither The Hague nor Amsterdam. To understand the innovations in Dutch painting between 1880 and 1910 - the trends that set in after the Hague School - it is necessary to distinguish between developments in The Hague in the wake of the Hague School and what was going on in Amsterdam. Without a knowledge of the background it is impossible to understand the disparity in the events that affected the evolution of art in Holland in those years, with its fundamental difference in outlook between the young generation of modern artists in The Hague and those in Amsterdam. The former group painted in an emotional and intuitive manner, entirely in the spirit of their famous predecessors, the Masters of the Hague School; the Amsterdam painters, on the other hand, followed a rational approach which they owed partly to their training at the Rijksakademie and perhaps even more to the spiritual climate of the city, which was by tradition inclined towards rationalism and intellectualism. The difference in starting-points between the Hague and Amsterdam artists, therefore, determined the roles they were to play in subsequent events. Contact between older and younger artists in The Hague was close, mainly because young artists still completed their training with a period in the studio of a more experienced painter as a result innovations were assimilated only gradually in The Hague -a logical consequence of the aims that the Masters of the Hague School had set themselves - and matured in the 1890s. The young artists in Amsterdam, however, were trained at a new 'institute of higher education', and in their direct surroundings were confronted not with a dominant older generation of artists but with a cultural and social situation that was suddenly and rapidly developing after a lengthy period of stagnation. Just as the Masters of the Hague School were deeply respected by the next generation, the Amsterdam artists who were young in the 1880s (the 'Eighties Generation') were admired well into the twentieth century. A final important consideration is the blossoming of art training in Amsterdam - a school of applied art by the name of Quellinus, orientated towards practical experience, was founded in 1879, followed in 1881 by the Rijksnormaalschool voor Tekenonderwijzers (State College for Drawing Teachers) and the Rijksschool voor Kunstnijverheid (State School for Decorative art and crafts), where more attention was paid to theory and pure draughtsmanship. (See also: Arts and Crafts movement.) All three institutions were connected with the building of the Rijksmuseum. Combined with the reorganized Rijksakademie and a number of private art schools, the educational facilities of Amsterdam attracted talented artists, young and old, from all over the country, who came to Amsterdam and in turn contributed to the successive stages of innovation. The new appeal of Amsterdam was fatal to the developments taking place in The Hague, however promising they had been. For details of a major champion of Post-Impressionism in Britain, see: Roger Fry (1866-1934). The National Salon held in The Hague in 1884 highlighted several developments in the work of advanced painters, both in that of the Masters of the Hague School, and in that of the younger generation. The paintings of the Masters, notably Jacob and Willem Maris, Anton Mauve, P.J.C.Gabriel, Willem Roelofs and J. M. Weissenbruch, were remarkable for the return of colour - during the 1870s they had used a predominantly grey palette. The work of the younger painters attracted attention either because of a 'criminal indifference to line and form' for the sake of'harmony in colour, tone and movement', or because of a preference for figure painting. The former criticism applied to the work of the two young Hague artists, Breitner and Van der Maarel, the latter to that of a number of Amsterdam artists including Van Looy, Van Rappard, Van der Valk and Voerman, and to that of the young Hague artist Isaac Israels, son of the great figure-painter among the Masters of the Hague School, Jozef Israels. The tendencies revealed at this exhibition were to remain for some time. Seen at a distance, they are patches of faded colour on a bleached, dusty, and mouldy wallpaper, and in this respect it has some qualities, which for me, however, are absolutely unsatisfactory. I cannot understand how it is possible for a man to make such a thing. It is like things one sees in fever, or impossible and absurd, like the most fantastic dream. I really think that Breitner has not quite recovered, and actually made these things while he was feverish. Apparently Van Gogh did not realize that artists like Breitner were already exploring the possibilities of colour to express the physical sensation of the world around them. Breitner was more interested in times and places where that world presented itself almost exclusively in terms of colour-planes, for instance the parade grounds of the brightly-uniformed cavalry stationed in The Hague, than in searching out situations dominated by human attitudes - the kind of scene that captivated Van Gogh. The sensation of colour, form and movement that artists such as Breitner sought to portray is directly linked with the portrayal of light which preoccupied the painters of the Hague School as well as the French Impressionists. Besides Breitner, the Hague colourists included Van der Maarel (1857-1921), Robertson 1857-1922), deZwart (1862-1931), Tholen (1860-1931) and Bauer (1864-1932), and two painters who lived in Leiden: Verster (1861-1931) and M. Kamerlingh Onnes (1860-1925). Of particular importance to the young members of the Eighties Generation was the emergence, about 1880, of a keen interest among the art collectors of The Hague in the plein-air painting of the Barbizon School, in realists such as Courbet and followers like Jules Bastien-Lepage (1848-84), as well as the still-life painting of Vollon, Philippe Rousseau and Ribot. This trend was bound up with the growing popularity of the young Masters of the Hague School, who were at that time becoming known as the leading innovators of art, and who professed an affinity with the French Barbizon School. The Barbizon School came to be known in Holland at that time as the modern school of French painting, and enjoyed that status for many years. A prominent role in arousing this interest in French artists was played by the Hague art dealer H. J. Van Wisselingh (1816-84) and his son E. J. Van Wisselingh (1848-1912), who was then working in Paris. Also influential was the Hague subsidiary of the French art dealers Goupil (Boussod & Valadon). Two of the collections formed in those years still exist: that of the marine painter Mesdag in the Hague Rijksmuseum, and that of Baron Van Lynden, bequeathed to the Amsterdam Rijksmuseum in 1900. In June-July 1882 Mesdag and three other collectors in The Hague displayed their recently acquired 'modern' French paintings at the Hague Art Academy. Camille Corot (1796-1875), Theodore Rousseau (1812-1867), Charles-Francois Daubigny (1817-1878), Jules Dupre (1811-89), Narcisse Diaz de la Pena (1807-76) and Constant Troyon (1810-1865) were numerically among the best represented artists. Remarkably, there was not a single work by Jean-Francois Millet (1814-75), although considerable interest had already been shown in him by all the more advanced painters in The Hague and Amsterdam. His work did not reach Holland for several years. At the end of the decade E.J. Van Wisselingh, who had taken over his father's business in The Hague in 1884, introduced Monticelli into Holland. His glowing colours pleased the young Dutch artists and collectors. By organising exhibitions in Amsterdam, E.J. Van Wisselingh soon drew the attention of young collectors in Amsterdam to the Barbizon School, and their interest lasted longer than that of their colleagues in The Hague. This was largely due to the influence of the subsidiary firm set up by Van Wisselingh in Amsterdam in 1890. For a British style of naturalism very similar to the naturalist Barbizon and Hague Schools, see: Glasgow School of Painting (1880-1915). The cool, clear palette of the French Impressionists was considered too intellectual, too cold, and not expressive enough. This is perfectly illustrated by an experience described by Vincent Van Gogh. In summer 1888 Vincent, through his brother Theo, attempted to interest his fellow countrymen, especially E. J. Van Wisselingh, in recent French art, notably Impressionism and the work of Paul Gauguin (1848-1903) and his Pont-Aven school. The canvases by these artists that Theo sent to the Hague branch of Boussod & Valadon were returned after some months. As far as we can tell no interest in them whatsoever was shown in Holland. Perhaps it was the Monticelli-like myriad colours that persuaded Baron Van Lynden to buy The Corniche, Monaco (1884) by Claude Monet (1840-1926) - for many years the only painting by a French Impressionist in a Dutch collection. In October 1880 a group of students at the Amsterdam Rijksakademie founded the Sint Lucas Society. The founding member, Anton Derkinderen (1859-1925), and the other early members of the board - Eduard Karsen (1860-1941), J. Van Looy (1855-1930), M. Van der Valk (1857-1935), Jan Veth (1864-1925) and Willem Witsen (1860-1923) - were to become known as the Innovators. The members' aim was to stimulate each other's interests in the fine arts, literature, drama and music, by organizing lectures and discussions. Its aim, therefore, was not only attuned to the nature of academic training at the time on both theoretical and practical levels, but also saw in it a challenge. The foundation of this society underlines the difference in training and outlook between young painters in Amsterdam and those in The Hague. Apart from lessons in draughtsmanship and free painting the Hague artists had received an exclusively practical training, and in view of the small number of artists there the need for a society like Sint Lucas was never felt. Several of the young artists in Amsterdam, such as Van Looy (who was to make a name for himself as a writer), Veth and Witsen, soon came into contact with those contemporary poets and writers who were to become known as the 'Eighties Generation'. In 1885 they started publishing a new literary and cultural journal, Be Nieuwe Gide (The New Guide), and asked their artist friends for contributions. Veth revealed himself in the journal as the mouthpiece of a generation in search of innovation, and was soon invited to produce work on a permanent basis by other progressive publications. He particularly admired the Masters of the Hague School, who owe their title of 'Master' to Veth's love of their work. His frequent reference to the art of Barbizon and everything Van Wisselingh brought to Holland, and his lack of enthusiasm for French Impressionism and Neo-Impressionism, helped to shape the opinions of Dutch artists and collectors about contemporary French art. It is thanks to the Amsterdam artists, and to Veth in particular, that De Nederlandsche Etsclub (The Dutch Etching Society) was founded early in 1885. The society published portfolios of etchings and put on exhibitions to interest the public in the neglected art of engraving. The shows soon expanded to include drawing as well as printmaking, and by inviting foreign artists to participate the society developed in a similar way to the Belgian group, Les Vingt. Moreover, its founders did not concentrate exclusively on their fellow Amsterdam artists, but from the outset were in close contact with young artists in The Hague. This resulted in a fruitful period of collaboration in the arts. The society lasted for ten years, and organized eight exhibitions. In winter 1886 Breitner moved from The Hague to Amsterdam; he may have felt the need for a more thorough academic training, or perhaps he was attracted by Amsterdam's cosmopolitan atmosphere or by its blossoming cultural life. Early in 1887 Isaac Israels (1865-1934) also left The Hague for Amsterdam. Until then he had had little contact with the artists of his generation, but once in Amsterdam he soon became one of its leading members. The impact of Amsterdam on Breitner and Israels was considerable, but the mark they left on the city was no less great. The young Amsterdam painters, who, it seems, had until then concentrated on realistic figure drawing, came under the spell of the art of sensation in the later 1880s. In this new trend realistic forms became subservient to the orchestration of full-bodied, contrasting colours, or merged into symphonies in virtual monochrome - representations of studio interiors, street views, canals and landscapes bathed in evening light or seen in misty weather. Among the leading Amsterdam exponents of sensation art were Karsen, Van Looy, Jan Voerman (1857-1941) and Witsen. Veth, being a portrait painter, remained faithful to realistic forms. Derkinderen took a quite separate position, tending towards a monumental idealism in the style of Puvis de Chavannes, whose work he greatly admired. Impressions, sensations, visions, orgies, symphonies of colour - all these terms recur in the review of exhibitions held between 1887 and 1893, and especially of those shows which focussed on the work of the younger artists such as the exhibition held in Leiden to celebrate the opening of the extension to the Museum in 1890, and the exhibitions held in the following years in Utrecht and Amsterdam for the five-yearly university celebrations. These three shows allowed them to display their common ideals and their affinity with the Hague School, and their conviction that Dutch art was regaining its old strength and vitality. Also highly appreciated, alongside the work of Monticelli, was the late work of Matthijs Maris, and his aloofness as an artist held a strong appeal for the Eighties Generation. Here, too, Van Wisselingh provided the link. In April 1890 Jan Toorop (1858-1928) returned to Holland for good after spending nearly eight years in Brussels. He had studied at the Amsterdam Rijksakademie from 1880 to 1882, and had been a member of Sint Lucas, becoming friendly with Veth, Van Looy and Derkinderen; he did not neglect these contacts when he moved to Brussels. In fact, he seized every opportunity of bringing his Dutch and Belgian friends and their work together. He became a well-known figure, and acquired a great reputation, especially in Holland. He did not disappoint his public. Surprisingly, Toorop did not settle in Amsterdam or in The Hague, but in an isolated fishing village to the north of The Hague, Katwijk aan Zee. He became obsessed with the harsh, insecure existence of the fishermen and their families. Evidently the cosmopolitan city of Brussels, where he was regarded by the most progressive circles, notably Les Vingt, as a gifted and original artist, did not allow his innermost feelings to crystallize into the dominant theme of his work: the realization that the experience of living means a constant battle between life and death. His Impressionist work is remarkable for his preoccupation with expressing the inner emotions of the people he portrayed. His paintings suggest that he must have been particularly interested in the way human beings unite in the face of disaster and death, and he probably hoped to find that human solidarity and struggle in its purest form in the fishing community of Katwijk, which he no doubt considered representative of a natural society unaffected by the modern world. He aimed in his Katwijk paintings to give visual form to this consciousness, and they reveal his perseverance in a search for adequate, expressive forms. To achieve this, he explored the potential of all the innovations he had encountered in Brussels - the Divisionism of Seurat and Signac, the decorative Synthetism and Cloisonnism of Gauguin and his followers, the expressive handling of Van Gogh, and Japanese Ukiyo-e woodblock prints and enamels, which were then considered highly modern. All these influences produced a highly personal style based on strong colour contrasts and a succinct, expressive, linear treatment. When Toorop exhibited the results of a year's painting in Holland in a series of exhibitions in summer 1891, he was instantly recognized as the most important innovator of the day. On the surface his work was in line with current Dutch colourism, but its content was very different. During 1892 Toorop's art underwent several profound changes. Colour was almost totally suppressed in favour of line and contour, the brush was replaced by the pencil, and representations of reality ceded to allegorical and symbolic themes - in other words, the personal element made way for a more collective underlying concept. Similar changes in form and content soon appeared in the work of Toorop's contemporary Derkinderen, and in that of numerous other, mostly younger, artists, notably Thorn Prikker and Roland Hoist (1868-1938). These four artists became the leading exponents of Dutch Symbolism around the turn of the century. Whereas art had been almost synonymous with colour in 1891, less than two years later the treatment of line had become all-important. A new generation had appeared on the scene. Toorop's influence extended beyond his art. In winter 1891 he joined the board of a new artists' society, the Haagsche Kunstkring (the Hague Art Circle), which embraced all artistic disciplines in accordance with the Wagnerian notion of Gesamtkunst (total art). He set to work at once with enthusiasm to end the isolation of Dutch art. In May 1892 he organized, on behalf of the Kunstkring, the first major Van Gogh exhibition, and in July-August he assisted Les Vingt in presenting the Pointillism of the leading French and Belgian Divisionists - including Georges Seurat (18591891), his main follower Paul Signac (18631935), Camille Pissarro (1830-1903), as well as Dutch painters like Theo Van Rysselberghe (18621926), Van de Velde, Lemmen and Finch, plus poster art by the French artist Toulouse-Lautrec, and, at his special insistence, drawings by Odilon Redon (1840-1916). The response to this Les Vingt exhibition was considerably more gratifying than it had been for the one he had mounted in Amsterdam in 1889. Particularly important was the visit Henri Van de Velde paid to the exhibition in The Hague and the relationships he established with Dutch artists. In October-November 1893 the Haagsche Kunstkring included works by Monet, Renoir, Sisley and Pissarro at one of its regular showings of members' work. Great though the response to these shows may have been, however, it was wholly concentrated in The Hague. That city consequently acquired a strongly international orientation, looking particularly towards Brussels and Paris. Toorop, who had moved from Katwijk to The Hague in 1892, was to play a decisive role in subsequent developments. These events are echoed in the work of several younger artists who had mastered the principles of Divisionism: Aarts in The Hague, and Bremmer and J. Vijlbrief (1868-95) in Leiden. Aarts, who was to become famous especially for his graphic art, soon abandoned Divisionism. Bremmer adhered to it, even though he gave up his career as an artist in favour of teaching and writing. Through his lessons and publications he encouraged artists and art collectors to adopt a more international critical attitude, and to value the light, clear palette so rarely used in Holland then. Many of his ideas are reflected in the collection of the Kroller-Muller Museum at Otterlo, which owes its existence to the advice Bremmer gave to one of his most eminent pupils, Mrs H. Kroller-Muller. Toorop returned to Divisionist painting in 1897, but a convincing explanation for this return has yet to be found. Whereas his work of 1889-91 was more Pointillist than Divisionist in style, he now kept strictly to the formal ideas upon which Divisionism was based. After several years of Symbolism, complex in form and content, he must have felt the need to reflect on problems of a purely painterly order. He went back to Katwijk, but this time he was interested solely in the subtle light-changes above the sea and the dunes. Although he exhibited his work regularly, from then on he had few followers. 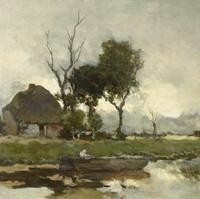 Thorn Prikker, who had abandoned 'fine' art in 1895 to devote himself to design, also surprised the public in 1901 with a series of Pointillist pastel drawings of landscapes painted in summer 1900 in the vicinity of Vise near Liege, Belgium; during the following four summers he was similarly occupied. Like his Symbolist works, these drawings are more abstract and intuitive, and less intellectually conceived than Toorop's Divisionist paintings and drawings. In 1901 Toorop and Thorn Prikker, together with two other artists from The Hague and the young physician and art collector W. Lauring, organized the 'First International Exhibition', with works by the Frenchmen Cross, Denis, Luce, Maufra, C. Pissarro, Redon, Signac, Steinlen and Vuillard, and the Belgians Claus, Degouve de Nuncques, Ensor, Morren and Van Rysselberghe. Remarkable in this display of the work of living artists was the inclusion of three paintings by Van Gogh and four by Cezanne, all lent by the Hague collector M. Hoogendijk. It was typical of the situation in Holland at the time that this 'First International Exhibition' failed to influence what artists were doing at home. The Hague had forfeited its leadership of the art world, and was accused of betraying the Dutch cause to foreign whims. The country's creative minds were now drawn towards Amsterdam, where there was so much novelty and mutual inspiration that there was no need for a more international orientation. In the end even Toorop could not resist the attraction of Amsterdam. His first major exhibition there was held in 1904, and he even moved to Amsterdam. In the meantime he had started painting with a broader brushstroke, as Signac and Van Rysselberghe had been doing for some years. As in his earlier Neo-Impressionist period, he tended towards the more expressive brushstroke, but now colour was his point of departure. Barbizon School and the late Hague School still continued to provide them with examples, and the flower and fruit still-lives of Henri Fantin-Latour, with their balanced composition and harmonious colouring, were also a significant influence. Interest in these two schools was also shown by the art dealers of Amsterdam, among whom the firms of Buffa and Preyer, besides E. J. Van Wisselingh, had now risen to prominence. The Amsterdam Stedelijk Museum for modern art was opened in September 1895, to accommodate the steadily expanding National Salon which was held every three years, and to house the collection of a society which had been formed in 1874, mainly by Amsterdam art collectors, to provide the city with a collection of modern art. By the time it moved into its new premises the society was run by a younger generation of members, whose admiration for the French art of Barbizon and the late Hague School was more outspoken than that of their predecessors. Thanks in part to the extended loans from two of these members, Amsterdam soon boasted a notable collection of paintings of those schools. However, interest in more recent international developments remained slight, as was shown by the cool reception given to several exhibitions - a small show of works by Monet, Pissarro, Renoir, Sisley, d'Espagnat, Maufra and Moret, held in the Amsterdam artists' society Arti et Amicitiae early in 1900; the large retrospective of Toorop in the Buffa Gallery in February 1904; and the Van Gogh retrospective in summer 1905 organized by Theo Van Gogh's widow in the Stedelijk Museum. In this fairly self-centred artistic climate Piet Mondrian (1872-1944) received his academic training between 1892 and 1896. Until c. 1906 his paintings display all the characteristics of the work of the late Amsterdam Impressionists, although he showed more concern with the principles of ordering - a concern revealed more fully in his work after 1900. In December 1900 a second show was organized in Amsterdam of the works that Jan Sluyters (1881-1957) had executed for the Prix de Rome. Besides the usual copies after old masters he exhibited some provocative sketches of Spanish dancers and scenes of Paris by night. It was not what the jury had expected; worse still, its members felt that the artist was entering a domain 'that did not lie within the sphere of the Fine Arts'. For Sluyters it must have been a gradual process. His search for a new, personal art form led him from Rome to Spain, and from there, in autumn 1906, to Paris, where he became acquainted with the latest developments in art at the Salon d'Automne, and with cosmopolitan life. It is possible that he was more attracted by Parisian life than by Parisian art. His Paris paintings show that he understood that the new developments in art were indissolubly linked with life in a modern metropolis, so much more intense and exciting than life in Amsterdam, and that a superficial rendering could not do justice to that intensity and excitement; it became necessary - more even than in the days of Symbolism - to use colour and line for their expressive value, even if that meant a break with tradition. It is hardly surprising, then, that Sluyters' Paris paintings were not appreciated at home. In April 1907 the board of the Sint Lucas Society refused to include his work in its annual spring exhibition, and in September the jury of the National Salon turned down his paintings. Forty years after the Salon des Refuses in Paris, Holland too had its refuse, complete with vehement reactions for and against him in the press and in the art world. One of Sluyters' defenders was the young critic Conrad Kikkert (1882-1865). His articles were written with as much warmth and intensity as Sluyters painted, and he undoubtedly helped to open the eyes of Sluyters' contemporaries to the implications of the style of painting Sluyters had evolved in Paris. However, it was some time before this new insight had a wide influence, and Kikkert seems to be exaggerating when he describes the Spring 1908 Sint Lucas exhibition as giving evidence of 'a new striving after a different light, plein-air, and more characterizations of moods, after a freer, more exuberant, passionate, light manner of rendering, technically with the dissection of colour, a swift, direct brushstroke, strong lines ... a new shoot on the branch of Modern French light-impressionism ... quite different from Van Gogh'. It is no coincidence that the same exhibition included 17 works by Toorop, at least 11 of them in the late Divisionist, sometimes pre-Fauve manner. Thus the significance of Toorop's work as representative of progressive French developments was recognized at last in Amsterdam. In January 1909 Toorop, now 50, was represented at a group exhibition of the other, much older and more conservative, Amsterdam artists' society - Arti et Amicitiae. The following month Amsterdam's new art gallery, De Larense Kunsthandel, held a retrospective of his work. Toorop's position in the Amsterdam art world was firmly established. In 1908 Van Gogh, too, at last obtained recognition in Amsterdam; in September the art dealer C. M. Van Gogh organized a fairly large exhibition of Vincent's work, with special emphasis on the paintings executed in France. Amsterdam was reassured. The new movement, in a direction that 'did not lie within the sphere of Fine Art', was, after all, a movement of true art and artists. For information about German painting at the end of the 19th century, see: Post-Impressionism in Germany (c.1880-1910). In January 1909 Mondrian, Sluyters and their friend the portrait painter C. Spoor were given the chance to hold a joint exhibition of their work in the Stedelijk Museum. At this show it became evident that Sluyters had found a convert in Mondrian, who was already quite well known. Indeed it must have been under the influence of Sluyters that Mondrian eventually broke away from late Amsterdam Impressionism. Kikkert maintained that Toorop had originally been meant to participate in this show, but had thought better of it. Mondrian and Toorop must have met during the previous summer in the seaside resort of Domburg in Zeeland. Toorop had been there every summer for about 10 years, both for his health and for the exceptional light, and over the years many artists had joined him there. It was Mondrian's first visit to Domburg; it is not known whether he and Toorop had already met before the Sint Lucas exhibition of 1908. In the long run Mondrian's contact with Toorop must have been more important than his association with Sluyters. A third convinced 'Luminist' (the name given to the followers of French Neo-Impressionism), Leo Gestel (1881-1941), presented himself at the Sint Lucas spring exhibition in 1909. With their Luminist paintings Sluyters, Mondrian and Gestel were thought to have established at last a link with the international development of art - with Impressionism and Neo-Impressionism, known as 'French light-Impressionism', from which the term 'Luminism' was derived. However, as opposed to the work of the French artists, the work of the Luminists is characterized by the use of unnatural colours and colour contrasts. The Luminists were thus moving in the same direction as French Fauvism and the expressionist movement in Germany, whose work was still unknown in Holland. In their use of unnatural-style colour pigments the Luminists, like the Fauves and the Expressionists, achieved a much more direct representation of the world around them than did the Impressionists and Neo-Impressionists. The Luminists' view of reality was essentially different from that of the Impressionists and Neo-Impressionists. In the eyes of Sluyters and his generation reality was a combination of separate elements. Thanks to the Neo-Impressionist system of colour analysis, artists had learned to distinguish between the naturalness of colour and its expressive value. By this new, abstract and expressive use of 'unnatural' colour, artists could visualize the individuality of the things around them. For a glimpse of Fauvist style Post-Impressionist painting in Scotland, see: Scottish Colourists, a group of four painters that included Samuel Peploe (1871-1935), Francis Cadell (1883-1937), John Fergusson (1874-1961), and Leslie Hunter (1877-1931). What Sluyters did more or less intuitively, Mondrian did much more deliberately. He knew of the Theosophic colour theories of Annie Besant and C. W. Leadbetter, which had been published in a Dutch translation in 1903. Going a step further than the Symbolists, Impressionists and Neo-Impressionists, he used pure colour in his abstract art to portray the deeper spiritual significance that he sensed in the things around him. Dutch Post-Impressionist paintings and drawings can be seen in some of the best art museums in the world. Notably the Rijksmuseum in Amsterdam. We gratefully acknowledge the use of material from Joop Joosten's article on Post-Impressionist art in Holland, published in Post-Impressionism (1979) by the Royal Academy, London.  For a chronological guide to Post-Impressionism in Holland, see: History of Art Timeline.  For more about Luminist painters and other Dutch Divisionists, see: Homepage.